There are 2 separate software programs needed to use RemoteToPC. There is remote host software that monitors computer metrics and allows for unattended remote access to the computer and join side software that allows you to connect to the remote host computer from your local computer. You can download and install both of these software programs from your Command Center screen. You will need to add HOST computers that you want to Monitor, and Remotely Access. Once you’ve added the HOST computers, they will appear in the Command Center. You can Remotely Access HOST computers by clicking the Command Center link with the name of that computer. The first time you click a HOST computer link, the JOIN Software will automatically download to your local computer and configure your browser (by adding a cookie) to access HOST computers. Be sure and complete that install. Below are instructions HOST and JOIN side software can be installed. There are currently several ways to install the Remote Host Software on a computer. Go to the computer that you wish to install RemoteToPC on. Login to Remote To PC’s Command Center from that computer, and click “Add Host Computer”. You’ll see this box pop up. Click Download. 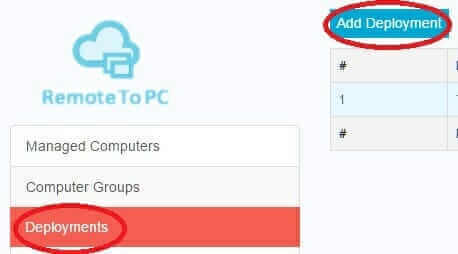 It’s already is populated with you local computer name, but you can type in a different name that you wish to identify that computer with in RemoteToPC. Next, click the Set Name button to continue the host installation. The last step is to set the Access Password to complete the install. 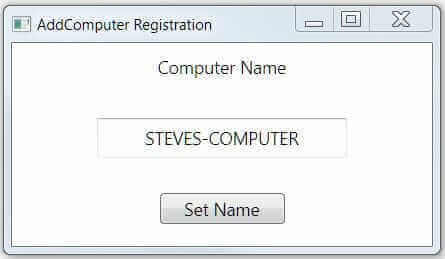 An Access Password should be a simple password that you can remember to complete remote connections to this computer. This password is separate from any Microsoft access passwords. Once you close the installation, you’re all done. You should now see a link to access that host computer in your Command Center. The only difference in a Host deployment download and a regular Command Center download is that a deployment file can install silently with no screen feedback, so it can be used with an application like PDQdeploy to install RemoteToPC on multiple computers at once within a domain environment. You can also preload an access password with a deployment. Copy and paste the link into a browser window, and download the deployment file, copy it to any computer you wish to install it on, and complete the install from there. Rather than downloading a file, you may wish to simply email the link to the deployment and email it to the computer that you wish to install RemoteToPC on to. To do so, follow the instructions in section 1 above to create a deployment. Click on that deployment to open it and copy the link address. Paste it into an email with some instructions to the user. 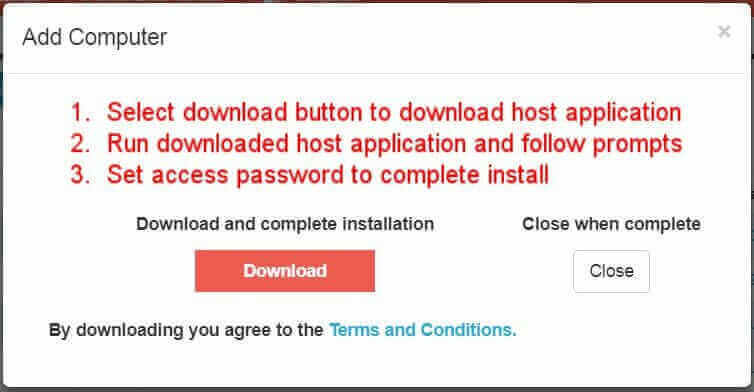 A user can click that link in the email, and begin the install themselves, or if you add the password to the link (option 4 below), it will be a silent install. Once they download and click on the installer file, it will install automatically and show up in the Command Center under their computers network name. When you click on a host Computer Name link in the Command Center for the first time, a menu will popup notifying you that the Join Software needs to be installed, and the download will automatically start once you click ‘Download now’. Complete the install steps, and close the popup window. Your browser should refresh. Click the Computer Name link again, and after a secure tunnel connection to the host computer is established, you will be asked to put in the host computer’s Access Password (the one you set when you install the host on that computer). Once entered, a remote desktop screen for that host computer will open, and you will be able to use it just as if you are there on that computer. 2 Reinstall Join Client button installation. If for some reason you delete the join client software off of your local computer, or your browser cookie gets deleted, you’ll need to reinstall the Join software to connect to remote computers. Just click the “Reinstall Join Client” button in the Command Center to reinstall it on your local computer. If you would like to connect to a host computer from a Mac, iPhone, or Linux system, you can through our browser client.